Four Peaks Chapter, NSDAR, is very involved in lending support to our troops, both veterans, and active members. We have donated long-distance phone cards to members’ relatives in the service, making it easier for them to keep in touch with loved ones serving our country. 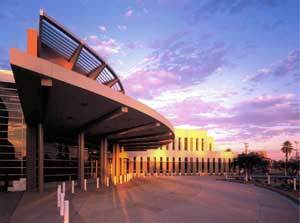 We make monthly visits to Carl T. Hayden Veterans Medical Center, donating needed items: books, magazines, toiletries, puzzle books, paper, notebooks, and clothes, just to name a few. Our Daughters’ visits at Christmas include stockings filled with assorted goodies, treats, and other things the veterans can use year round. We also support Victory House (a male Veterans' facility) and Mary Ellen's Place ( a female Veterans' facility) with clothing and toiletry donations. This summer, we collected 12 bags of clothing to be distributed to the facilities. Last year, we began a knitting project to make scarves for homeless veteran centers in the Valley. A large portion of our members participated, creating 60 scarves, and we look forward to continuing this project for the upcoming winter. Our chapter supports the Fountain Hills Food Bank with donations of 10lbs sacks of potatoes during the holidays. We also donate Teddy Bears to the Fountain Hills Fire Department in order to provide comfort to children in the midst of emergencies. Four Peaks Daughters support our local schools. Four Peaks Chapter, NSDAR, participates in local patriotic celebrations and encourages proper display and respect for the American Flag. Thousands of area residents enjoy the chapter's patriotic float on the 4th of July. We distribute cards to those in attendance, imprinted with the words of the American’s Creed. We celebrate Constitution Week with a proclamation given by the Mayor of Fountain Hills. We provide fifth graders constitution booklets. The winners of the Four Peaks Elementary School History Contest read essays and show the posters they've created. We award each participating student with a certificate. We hold a moment of silence and prayer, remembering those who lost lives in the 9/11 terrorist attack. Our members participate in ceremonies for Memorial Day, Veterans Day, Armed Forces Day, and other honor events. Four Peaks Daughters place wreaths at local Veterans Memorials in December each year.